Liverpool play their second Champions League group match against Spartak Moscow in Russia on Tuesday. Here Press Association Sport's Carl Markham looks at some of the issues. Liverpool manager Jurgen Klopp during the training session at Melwood, Liverpool. WILL WE STILL BE TALKING ABOUT THE DEFENCE? A 3-2 victory over Leicester on Saturday ended a four-match winless run but it hardly quietened the critics who have been lambasting manager Jurgen Klopp over his leaky backline. Three of that back four - Dejan Lovren, Joel Matip and Alberto Moreno - are currently first choice but the manner in which they twice allowed the Foxes back into the game at 2-0 and 3-1 suggests there is still work to do. A clean sheet against the Russian champions who are struggling this season would help start the rehabilitation process. With Sadio Mane now free from his domestic ban and Philippe Coutinho fully match fit after missing the start of the season the Reds have some tasty-looking options going forward. The question is how Klopp fits them all in. 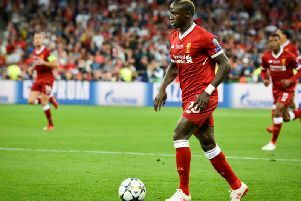 It remains to be seen whether he will be bold enough to field a front three of Mane, Roberto Firmino and Mohamed Salah in Moscow with Coutinho playing a deeper midfield role. That may be the case for stubborn Premier League opponents who make themselves difficult to break down but may be a touch too aggressive in a European away tie. In their first outing against Sevilla Klopp selected Loris Karius in goal ahead of regular Premier League number one Simon Mignolet and nominated the German for the role in all Champions League matches. That was only Karius' second appearance of the season and he has not played since but his manager has unswerving faith in his compatriot and believes his rotation policy can only strengthen his goalkeeping options. However, Karius, who has yet to entirely convince since arriving from the Bundesliga, in the summer of 2016, knows he is only one mistake from making Klopp look foolish. Last week Spartak were punished by UEFA after their fans lit flares and threw them onto the pitch in the 1-1 draw against Maribor in Slovenia. As a result supporters will be banned from travelling to their next away game but will be out in force in Moscow. Considering the dwindling reputation of Russian fans in general since last year's European Championships it seems unlikely they will tone down their actions for the visit of one of Europe's most decorated clubs. Expect the intimidation factor to be high both inside and outside the stadium, with Liverpool's fans having been given warnings about their personal safety ahead of the trip.